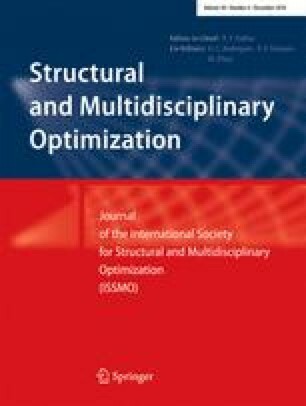 A topology optimization framework is proposed for robust design of skeletal structures with stochastically imperfect structural members. Imperfections are modeled as uncertain members’ out-of-straightness using curved frame elements in the form of predefined functions with random magnitudes throughout the structure. The stochastic perturbation method is used for propagating the imperfection uncertainty up to the structural response level, and the expected value of performance measure or constraint is used to form the stochastic topology optimization problem. Sensitivities are derived explicitly using the adjoint method and are used in conjunction with an efficient gradient-based optimizer in search for robust optimal topologies. Topological designs for three representative examples are investigated with the proposed algorithm and the resulting topologies are compared with the deterministic designs. It is observed that the new designs primarily feature load path diversification, which is pronounced with increasing level of uncertainty, and occasionally member thickening to mitigate the impact of the uncertainty in members’ out-of-straightness on structural performance. This work was supported by the National Science Foundation under Grant No. CMMI-1401575. This support is gratefully acknowledged. Asadpoure also acknowledges support from University of Massachusetts College of Engineering.